Along with breathtaking views of the Collegiate peaks, Colorado's tallest mountain range, and spectacular surrounding scenery, the upper Arkansas river offers so much to do and enjoy all year round you'll know why you came here to enjoy the best of Colorado. Centrally located in the heart of the Rockies on the Collegiate Peaks Scenic Byway 1.5 miles north of Buena Vista, Snowy Peaks offers large (big rig friendly) RV & tent sites with grass, trees and picnic tables. Enjoy free cable TV included in most of our sites. Access the internet with our free high-speed WIFI available throughout the park or dial up access in the clubhouse. For your convenience a full laundry facility and propane are also available. Or better yet, relax and enjoy our private family style showers and spacious clubhouse with a full kitchen, TV area and tournament class pool table. We offer recreational facilities & activities, cookouts, campfires & live music. Well mannered pets are always welcome. Visit our Facilities page for more details. In case you want to come back soon or frequently, we offer on-site RV storage and convenient set-up and return-to-storage services. All you have to do is show up and enjoy yourself! If you want to bring more people than are comfortable in your camper, or perhaps you just don't want to pull yours in the mountains, or maybe you don't have a camper and want to try one out - no problem we offer late model travel trailers and pop-up trailers for rent. 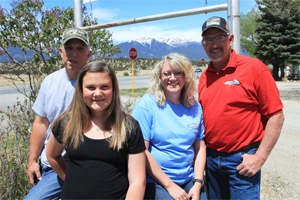 See a review of Snowy Peaks RV Park in Camping With A View, a web site featuring an exclusive group of campgrounds with beautiful views. Original photos and text are Copyright © -2009 Snowy Peaks RV Park. All Rights Reserved. VistaWorks® and Website logos are Trademarks ® of Global Vista Technologies, Inc. dba VistaWorks. All other original material, photographs, images, logos, HTML code and server side programs are Copyright © 2009 Global Vista Technologies, Inc. dba VistaWorks. All Rights Reserved.